Hermes silver plated champagne wine cooler or ice bucket. This Amazing object speaks for its self. It was a custom order pieces with the hand-stitched leather handle. Its the best of Hermes! 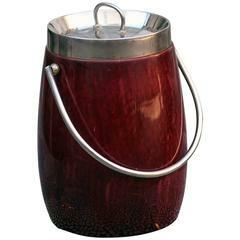 Ice bucket or champagne cooler in red goatskin with glas inlay, made by Aldo Tura Italy, 1970. A lovely double champagne cooler from the House of Louis Roederer, one of the last great independent and family run champagne houses.